Labour has committed to renationalising a series of industries from rail to mail. The policy presents a gift to the Tory media to ask the question of where the money for such policies will come from. In fact, there is no reason for Labour to “nationalise” these industries, because their capital is already “socialised”. All that Labour needs to do is to change the laws on corporate governance, so as to prevent shareholders from exercising any control over it, and that would cost a Labour government nothing. It also deals with the problem of “capital flight”. Let's deal with the facts. When an individual sets up a company, and uses their own money-capital to do so, they use their money to buy premises, machines, materials and to employ labour-power. They no longer then own money-capital, because it has been metamorphosed into productive-capital. Instead of owning money-capital, they now own productive-capital, and it is up to them what they do with it. But, such an individual may also borrow some money-capital from a bank, which they then metamorphose into productive-capital. The bank lends this money-capital for a given period of time, at a given rate of interest. The bank continues to own this money-capital, even though it is not in their possession. They can ask for it back within the terms of the loan agreement, along with the interest. However, the bank does not own the productive-capital that the individual private capitalist has bought with this money. That belongs to the individual capitalist, and they control it, not the bank. Provided the individual capitalist conforms to the loan agreement, and makes the required repayments, the bank has no more right to tell them how to use their capital, than it does to tell a homeowner, what colour to paint their living room, just because they gave them a mortgage to buy a house. But, larger businesses require more money-capital, in order to be able to undertake business on a larger scale than does an individual private capitalist. Moreover, the cost of borrowing these larger sums is lower if other means of financing are used. A large company might, for example, issue bonds or debentures, and these can be bought by the public, and financial institutions. Such bonds offer to pay a fixed amount of interest, or coupon, for the duration of the bond, and to give back the face value of the bond to the buyer at the end of this period. Once again, the lenders, who buy these bonds, do not have control over the productive-capital that the company buys with the borrowed money. An economic and legal agreement is entered into by the borrower and lender, the bond issuer and bond buyer. The former agrees to pay the latter the market rate of interest on the money-capital they lend, and to return their money-capital to them at the due date. But neither the economic nor legal agreement requires the borrower to give the lender control over what they do with the borrowed money, or over the productive-capital they turn it into. Once again, the lender, the bond buyer, remains the legal owner of the money-capital, although in return for interest, they have temporarily given up possession and control over it. The borrower, the company issuing the bond, does not own the money-capital, but they have possession of it, and control over its use, including the right to use it as capital, to metamorphose it into productive-capital. The interest they pay, is the price for that usage of the money-capital, of its potential to create for them the average rate of profit. The company that has borrowed the money-capital does not own the money-capital, but owns the real capital that it has been metamorphosed into. It is that real capital that produces the profit, that enables the interest to the money lender to be paid. 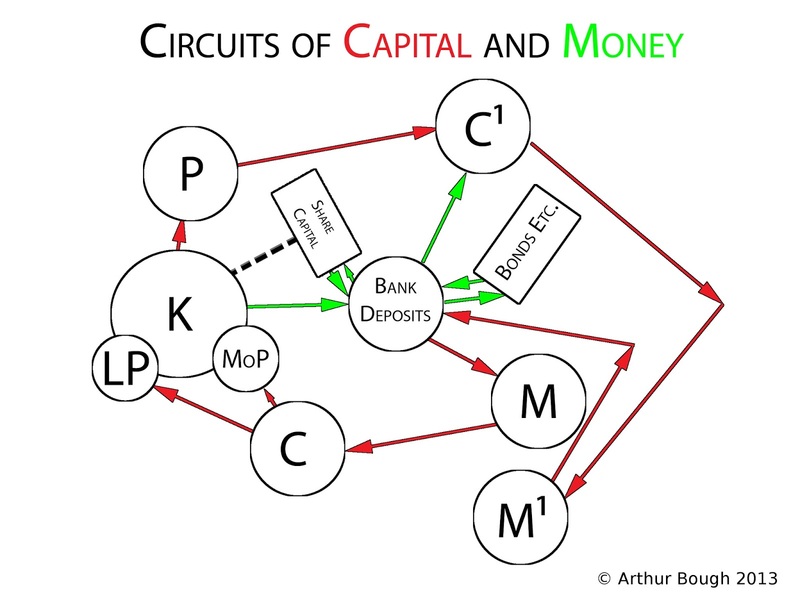 The money lender, or bondholder, owns the money-capital, that they have rented out to the productive-capitalist, in return for a bond that pays them interest. This bond is not real capital. It is fictitious capital. That is, unlike the real capital represented by the factory, machines, materials and labour-power, it has no power of its own to create profit. Its own value increases, only because the productive-capitalist uses it to acquire productive-capital to engage in production of goods and services, and thereby to create a profit. A company that issues shares, is then no different than a company that borrows money from a bank to use to turn into productive-capital, or which issues bonds to obtain money, which it uses to turn into productive-capital. These are just different ways of a company obtaining money, to use as money-capital, which can be turned into productive-capital, which the company owns, and uses to produce profits. Logically, those who lend money to companies by buying the company's shares, have no more right to demand control over the productive-capital that the company acquires with that money, than do bondholders, or banks who make such loans. Yet, they do. “... do BT shareholders own BT? Begin by noting the difference between the statement “BT shareholders own their shares in BT” and the statement “BT shareholders own BT”. There is not much doubt that the first of these is true. They enjoy the rights of possession of their shares – even under CREST, you can still insist on holding a physical share certificate if you want one. And no-one will dispute your right to the income from the shares, or to the capital value of your shares, or argue with you if you want to sell them or give them away. You may not use your shares harmfully – it is difficult to think of how you might – and your creditors may take them over when you fail to meet your obligations. There is no logical, economic or juridical reason that shareholders should be any different to bondholders, or a bank that lends money to a business, in terms of being able to exercise control over capital, which they do not own, i.e. the firm's productive-capital, which has been bought with the borrowed money. Indeed, there is no such reason why they should exercise any control over the use of the money they have lent either. By agreeing to pay interest, in the form of dividends, the company has agreed to pay the market rate of interest to the lender of the money, precisely in order that the company, not the lender should be able to exercise that control, and obtain the use value of the capital to produce profits. To use Kay and Silberston's example, taken from Honore, it would be like someone agreeing to lend you an umbrella, for a given charge, but then continuing to use the umbrella themselves, or dictating how and when it could be used. The only reason that shareholders have this unwarranted right, to determine company policy, to appoint Boards of Directors, and company executives comes down to a question of political power, just like, in the past, the political power of the landed aristocracy allowed them to pass legislation through Parliament that gave them unwarranted rights and privileges. The owner of a company's actual productive-capital, is the company itself as a legal entity in its own right. And, the company can be nothing other than the people employed by it, from the most important manager, down to the day labourer who sweeps the floor. The company is nothing other than these “associated producers”, and it is they who should exercise democratic control over the company's capital not the shareholders, who merely loaned money to the company in return for interest, and the potential for capital gains, if the company's shares increased in price. Other countries have recognised this simple fact, and at least partially acted upon it. Germany, for example, established co-determination laws, back in the middle of the 19th century. They guarantee the workers in company's over a minimum size the right to elect half of the supervising boards of the company. In 1975, Harold Wilson asked Alan Bullock to undertake an inquiry into industrial democracy in Britain, along similar lines. The Bullock Report, proposed changes to company law that were slightly more far reaching than the co-determination laws in Germany, which still enshrine a majority for shareholders by giving them the casting vote of the Chair. And at the same time the EU, in its Draft Fifth Company Law Directive, made proposals to extend such industrial democracy across the whole of the EU. But, in the late 1970's, conservative governments, like that of Thatcher in Britain came to power. These conservative parties are based upon the owners of fictitious capital, share and bondholders, as well as the remaining small private capitalists. Despite the fact that the Tory media talk about Labour being hostile to business, it is actually these conservative parties that are hostile to actual business, because instead they look after the interests of these money lenders, that seek to drain money from businesses, in dividends and other such payments, and thereby reduce the ability of businesses to invest and to expand. The political power of conservative parties and politicians from the 1980's onwards, prevented the further development of industrial democracy that was required to ensure that large-scale socialised capital could be managed and organised rationally and democratically, and instead increased the power of the money lenders, and of fictitious capital. It was part and parcel of blowing of financial asset and property bubbles, and of massively increasing debt that these parties promoted in the 1980's and 90's, and which led to the financial meltdown of 2008, and the even bigger one to come. So, there is no need for a Labour government to spend any money nationalising any companies. The large companies are already socialised. They already own their own capital. It is merely that current company law allows shareholders to exercise unwarranted control over capital they do not own, and which actually belongs to the company, to the workers and managers within each company. Why on Earth would a Labour government pay money to shareholders to buy back real capital that does not belong to those shareholders in the first place? That makes no sense. They could, of course, pay money to buy back the shares that those shareholders own, but again why would you want to do that? 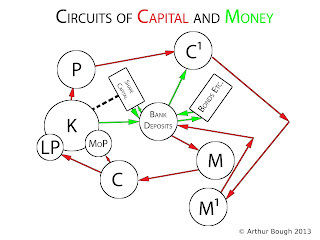 In order to to raise the money to buy the shares, the government, or the workers in the company would have to borrow the money on the capital markets, and by and large, the people who would be lending the money on those capital markets, for example to buy government bonds, are the same people who already own the majority of shares. It would simply be swapping shares for bonds! All that a Labour government need do is to change Company Law. That overnight would change the relationship in every company. It would simply say that shareholders had no right to elect boards of directors, or to appoint executives of companies. It would vest that right where it belongs, democratically in the hands of the company itself, of its associated producers, the workers and managers within the company. The shareholders would continue to have the right to exercise control over the only thing they do own, their shares. They could buy and sell them as they wish, and would be entitled to receive a dividend on them. The company would have an economic imperative to pay dividends that matched the market rate of interest, because if they did not, they would be unable to raise additional funds by selling more shares, and the price of their own shares would fall, so that they were less able to use those shares as collateral. In the end, that is even beneficial to shareholders and bondholders, because with more of the profits being invested productively, rather than paid out in dividends or inflated salaries to executives, all companies would produce more profits, which means they could then pay out more in interest. There would be no cost to workers or to a Labour government of such a policy. Moreover, it does away with the problem of capital flight. What a company is actually concerned with, what enables it to make profits so as again to be able to invest, is not its shares, but its actual capital. Shareholders can be free to sell their shares, as part of a process of capital flight, if they choose. It will not affect the real capital of the company, its buildings, machines and so on, which have been bought from the money raised long ago, in the issue of those shares. All of that real capital would continue to function unchanged. It would be the shareholders who would lose out, because all they own is shares, bits of paper, and the more they sell those shares, the more the value of the shares they own gets reduced. They would simply be reducing their own fictitious wealth. In fact, as I've set out previously, its because of that fact, that if I were a Labour Chancellor, one of the things that I would do, alongside changing the laws on corporate governance, as described, would be to scrap Corporation Tax, and instead to place that tax burden on dividends, capital gains, and via a wealth tax. After all, we want companies to use their corporate profits to expand the company, and with workers exercising control over those profits, they would have a direct interest in doing so. Workers in control over their own companies would not take kindly to a large chunk of their profits, and potential for growth being taken by the taxman. Instead, by more heavily taxing dividends, and other forms of unearned income, along with heavier taxation of capital gains, which are by definition unearned income, and through a wealth tax on all financial assets, and property over a minimum level of say £10 million, a Labour government could bring about a powerful economic boost that would itself generate the tax revenues to finance other aspects of its agenda. Why Would Anyone From The EU Come To Britain?